The Film Examiner - Essays on Film: Who Was She? “She was more or less forgotten by the industry she helped create,” Martin Scorsese said in 2011, while presenting a remarkable lady a Director’s Guild of America tribute posthumously. Scorsese went on to praise her as “more than just a talented business woman, she was a filmmaker of rare sensitivity, a remarkably poetic eye, and an extraordinary feel for locations.” I graduated from film school and spent much time studying the first filmmakers, not only for coursework but for my own curiosity and yet, until only a few weeks ago, I had never heard of Alice Guy-Blaché. Little did Alice Guy imagine, when hired by French film legend Léon Gaumont in 1894 as a secretary, that she’d become a driving force behind a new industry. When the still-photography company where the two worked closed, Gaumont bought the operations inventory and went into the budding field of motion picture making, taking Mlle. Guy to be his head of production. 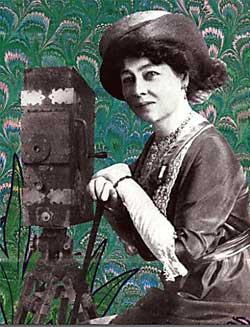 With Gaumont, Alice Guy thrived, and from 1896 to 1906, she wrote, produced and directed some of the earliest narrative films. Along the way, she helped to develop the “language of film”: those visual conventions we now take for granted in cinematic storytelling. She actually pioneered early special effects and even experimented with sync-sound. In the 1890’s, the rules hadn’t been written yet, and Mlle. Guy embraced the new world of moving pictures with a kind of creative passion that is the hallmark of a true artist. 1906’s The Birth, The Life and Death of Christ is Guy’s most notable achievement during her years with Gaumont; a “tent-pole” production for its day, requiring over 300 extras. It is hard to imagine how such a revolutionary force behind the cinema should be so easily forgotten. Perhaps, Alice Guy-Blaché was simply written out of the history books at the behest of historical and financial giants such as Thomas Edison. Perhaps, she is all but forgotten because she was woman working at a time when it truly was a “man’s world”. Perhaps, she missed the boat (or rather, the train) to Southern California when other film companies were finding the East Coast too costly and restrictive for their business. Most likely, it was some sad combination of all three. Thankfully Mme. Guy-Blaché was never completely forgotten, and the memory of her work is soon to be brought to the forefront of our collective memory. Inspired by a short television segment, Pamela Green enlisted the aid of friend and business partner, Jarik van Sluijs, and the two have developed a documentary on this all but forgotten filmmaker. This project, titled Be Natural – after the message on a large sign, which Mme. Guy-Blaché had at her New Jersey Solax studios - has been endorsed by Robert Redford as well as dozens of other filmmakers and actors, both male and female. Jodie Foster has even recorded the film’s narration. Not content to create a run-of-the-mill documentary on such an intriguing person, Green and van Sluijs conceived an approach befitting their subject and message. Everything from the way they conducted their research to the recreation of Alice Guy-Blaché's world (using 3D modeling, compositing, and animation), and even the manner in which they intend to edit the film has been designed to put their audience in Alice Guy-Blaché's shoes. “I’m The First Female Film Director – Who Am I?” is the question posed by Be Natural’s flyers. Her name was Alice Guy-Blaché, and she was more than just the first woman filmmaker; she was one of cinema’s earliest innovators. A visionary, this amazingly talented individual deserves a place of honor in film’s history alongside the Lumiere brothers, Georges Melies and Cecil B. DeMille.